By far, the number one draw to the North Shore in the fall is the incredible natural display of color. The stunning maple hillsides usually peak in color around the second weekend of September (although this can vary depending on the weather.) The birch and aspen along the big lake linger into early October. The link (below) to the Superior Trails fall color page offers trails, descriptions and maps of driving tours. This time of year is our busiest, so be sure to make your reservations early. Fall is considered by many to be the best season for a canoe camping trip. After Labor Day, the woods are quiet and the bugs are few. The weather can get a bit chilly, but there are still a fair number of bright sunny days. If you are looking for a day trip adventure, we have several cabins on or near great canoeing lakes. The website link below has great information about canoeing in the Boundary Waters Canoe Area Wilderness (BWCAW). The Superior Hiking Trail is truly spectacular in the fall. The trail follows many of the maple ridges exploding with red and orange during this beautiful season. Summer ends but fishing season does not. Fishing can be great in the fall, especially because the bugs are fewer and the fish hungrier. Fall is a quieter time on most lakes. The options for fishing are numerous so give us a call for directions to the right place for suggestions, guides or rentals. We do have cabin rentals on some great fishing lakes. Hunting is a major fall activity in Cook County. In order of order of open-to-hunt times are: grouse, moose, deer. Most of our rental homes are within easy driving distance of good hunting spots. More information on seasons, licensing and other regulations is available on the DNR website link below. A wonderful way to experience new art and meet the artists. This studio tour, in its second decade, promises to continue long into the future. Twenty-five artists were featured last fall, from Duluth to the Canadian Border. A perfect way to complement a leisurely trip north on Highway 61. 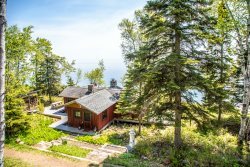 North House Folk School in Grand Marais is a cool place to visit any time of the year, but especially in September while hosting the Unplugged Music Festival. The guest artists change from year to year, but one thing that doesn`t change is that it is always a group of nationally-renowned musicians and a weekend filled with fun classes. Fall is one of the best times to observe Lake Superior`s awesome power. Although November is the traditional month for big storms, any storm in the fall or winter can become a wave-crashing squall. Our biased opinion is that the living rooms of our many Lake Superior rental homes are the best (and most comfortable!) places to watch this natural wonder. Waters Meet Spa and Wellness Center in Lutsen We value your special time with us, for rest, reflection and renewal. Massage services are provided by members of an association of experienced wellness professionals who work cooperatively at either of the two north shore locations.